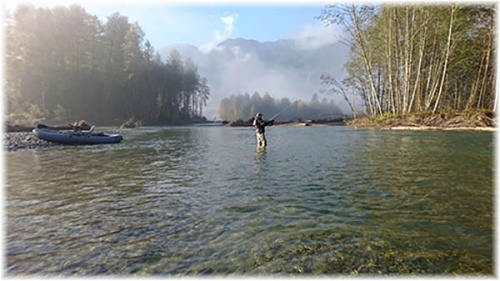 Here centered in the remote Upper Pitt River Valley a short distance from Vancouver, British Columbia we guide clients on some of the most productive years around river fishing in South Western British Columbia. Here we have spectacular fishing for some of the largest Trout in B.C. but is one of the final destinations for all the returning Pacific Salmon species. If you are thinking of coming to South Western British Columbia for your next fishing vacation, then look no further. 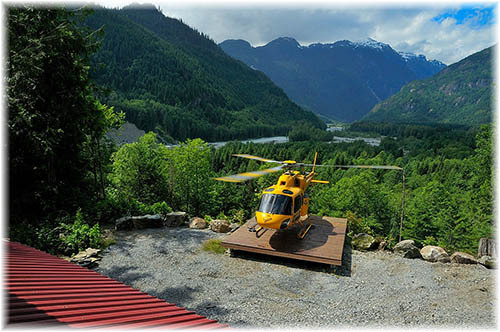 The Fly Fishing Lodge in British Columbia located in the upper Pitt River Valley in the most remote and least accessible corner. Snow-capped mountains surround what has been deemed Vancouver’s best kept secret. We have the knowledge and the guides if you are coming to Vancouver British Columbia, then why trust your fly fishing vacation with anyone else? Our family has lived and guided from our first lodge the Pitt River Lodge on the Pitt River for over 25 years and know its secrets better than anyone. We take pride in our ability to share our in-depth knowledge and love of the area with you. Today, our guests travel from all over the world to stay with us at our lodge. Many angling destinations in British Columbia are deservedly famous, but none is closer to Vancouver than us located in the privacy of the Pitt River Watershed. Here the fishing pressure is light, and you may not see another angler all day, yet the quality and productivity of the fisheries are as high as anywhere in British Columba or Alaska. The breathtaking surroundings that we call home and the comfortable ambiance of our lodge make this a very special place. We are fortunate to live here, and we realize the uniqueness of this land. We invite you to join us. Pack your bags and come to experience a true wilderness getaway.